Last summer, Kids Love Greece worked with travel blogger Sarah Knight, helping to plan some experiences for her family in Greece. 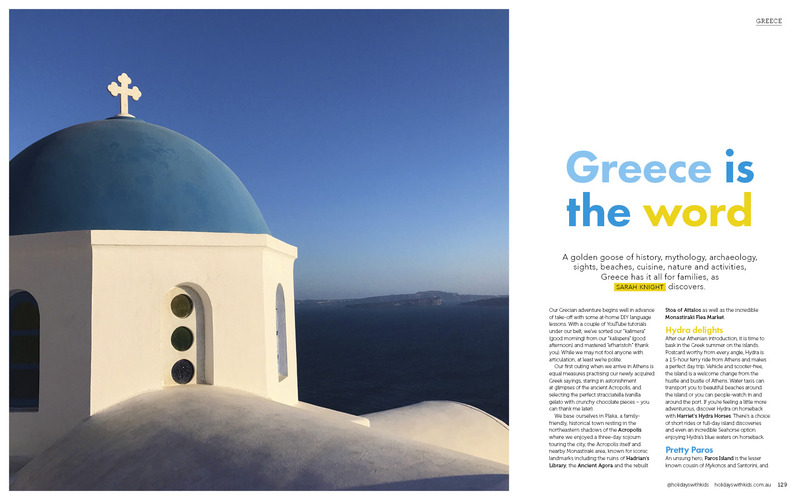 She loved her time in Greece so much, she's published an article about them in Australia's number one family travel magazine! 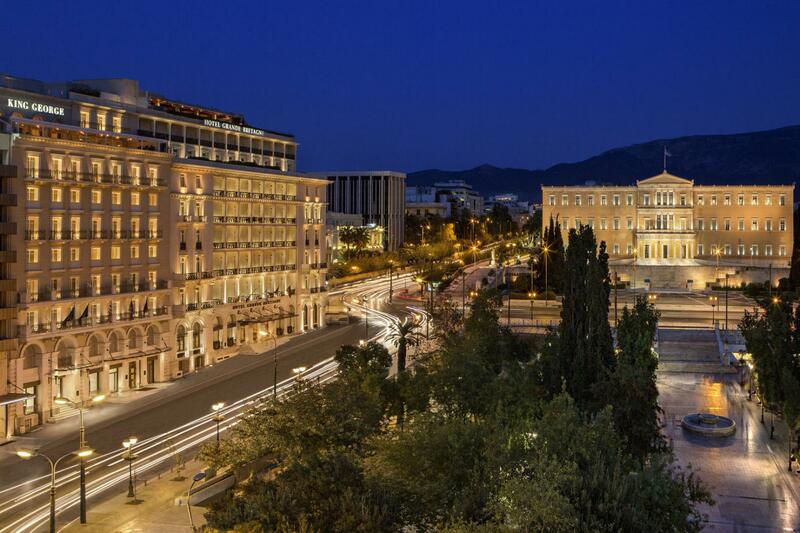 King George, Athens is a luxury boutique hotel located in the very heart of the city. Combining grandeur with modern amenities, this inspiring 5 star accommodation is the perfect base from which families can explore the beauties of Athens. Excellent food in a waterfront harbour setting . A unique ‘garden’ fashioned out of local pebbles and stones in Kalives area. Admire the local art of Giorgos Khavaledakis - something different strange, odd, unique, and totally amazing. An affordable hidden gem in the heart of Athens, highly recommended by both locals and tourists. Established over 30 years Kaplanis taverna in Arahova is known for its excellent food. No wonder why it is so highly recommended by locals. 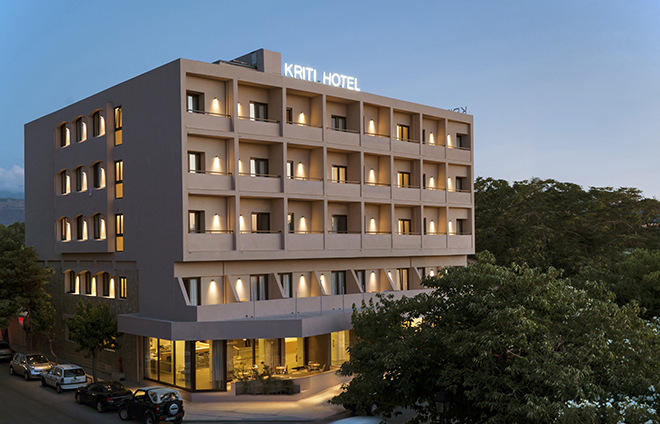 The recently renovated Kriti Hotel is waiting for you to discover the beauty of the nearby Venetian harbour, the most picturesque area of Chania. Clear water and delightful scenery at one of the most beautiful places in Crete. Let the Prince of the Lilies and the Blue Ladies guide you through the palace's maze and take you back in time... to the magical era of King Minos, Princess Ariadne and Minotaur - the mythical monster. Could sweet and salty water co-exist? At Kalivaki beach everything is possible. Kipos café is the only historical café left in Greece, according to official sources. Beautiful both inside and outside, this is the perfect place for your children to play around in the park and the café playground while you relax. Located in a fashionable square, Klidi café is the best choice for any time of the day. If you feel like a quick bite to eat and would like something traditional, go for a souvlaki at Kalamaki Kolonaki in the heart of Kolonaki. If you visit beautiful Ierapetra, make sure that you do not miss Kleio taverna. If you love Cretan cuisine, Kalliotzina taverna is the place for you. A traditional family restaurant ideal for lunch on a Saturday or Sunday, offering delicious local recipes, fresh ingredients and good service. Kritamon restaurant offers Cretan cuisine with a gourmet twist. If you find yourself in Rethymno and you have a craving for delicious grilled meat, stop at Kombos Tavern in Atsipopoulo. If it is hard for you to leave the comfort of your home, Katoikia Gonia Family Villas is the place for you. Neither you nor your children will miss anything as you will find all the comforts of your home (and maybe even more) in this modern house. Kakkos Bay, though an old hotel, is still a popular choice for those families choosing to holiday in the Ierapetra area. The recipe is simple: beautiful beach, good food and friendly staff. If your kids are young and love the beach, Knossos Beach is an excellent choice for your holiday. The hotel is made up of bungalows that blend well into the natural landscape. The beach is sheltered from the strong summer winds. If you like that quaint feeling of being in a small village, Kalimera Archanes village is definitely the best choice. You will have an authentic experience in one of the most charming villages of Crete. Visit the best archaeological site in Crete and one of the most significant in Greece. 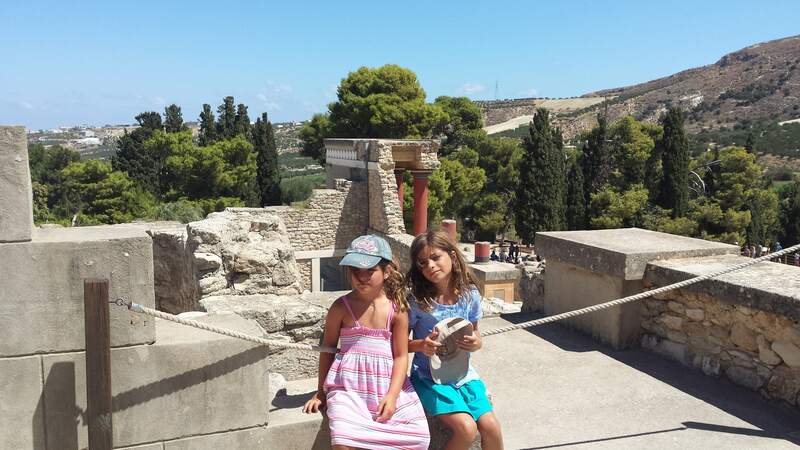 Our Knossos private family friendly guided tour will be your ticket to an amazing experience! Have you ever dreamed of cruising the beautiful Greek ‘grand bleu’ sea while discovering the Greek islands in your own private yacht, dining under the stars, and visiting secluded beaches that are private to you and your family? 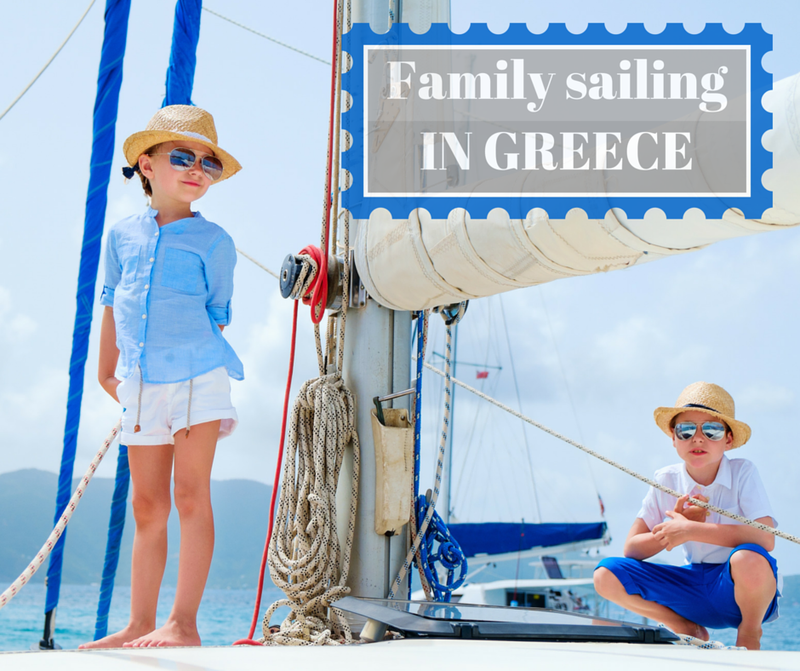 Want to travel to Greece with your family? Contact us for your CUSTOMIZED trip itinerary to Greece.